My artwork consists of installations, sculptures, paintings and work in other media inspired by the combination of word and image in communication and meaning-making. More specifically I am influenced by a huge spectrum of fields and interests: psychology, Social Influence Theory, propaganda, modern advertising practices, Classic literature, silent films, pop culture, Renaissance art history, Greco-Roman history, and so on. This seemingly disconnected slew of influences is sort of mirrored in my work. I combine numerous references and stylizations that may seem unrelated and assemble them in a manner that threads a loose thematic continuum, forms a dialogue between them. Bringing these different elements together into a whole is somewhat like composing notes in music. It feels a lot like writing a poem, especially working on my sculptures or installations. Each image or text reference functions like a symbol. 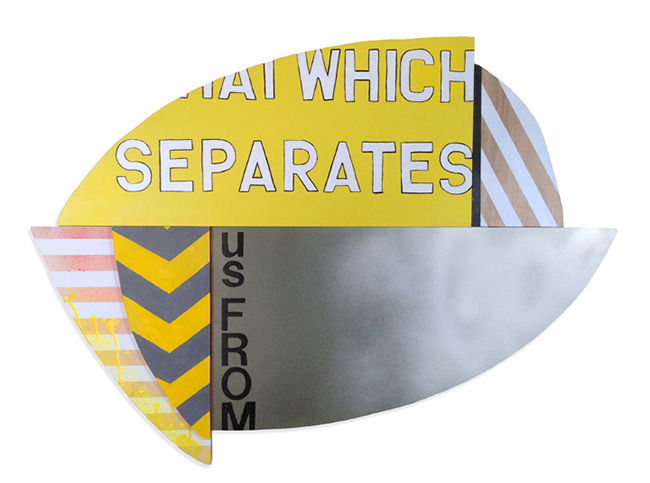 How each viewer puts the puzzle of symbols together is where the works breathe and become their own living whole. Overall, you could say my work is a colorful long-form study of modern communication and meaning-making amidst the poetry of movement in space. My background is diverse but all the areas somehow inform the hows, whats and whys in my studio. I have written poetry since a young age and spent several years recently as a contributing arts writer for several publications and art sites. Though the nature of how I have approached poetry and arts writing doesn’t relate to the content of the text I choose in my text based art work, I have a strong disposition towards good editing, the placement of words, negative space in composition of text and the importance of rhythm and “what’s missing” in the text realm that relates to my interest in poetry. Additionally, I have my Masters in Counseling and Art Therapy, which has a direct impact on the content of my work, the combination of word and image in meaning making. I chose not to move forward with a career in Art Therapy, beyond facilitating workshops and consulting for a couple of years. Rather, my education and training in cognition, identity, the power of word and image and the formation of the psyche influenced my work as an artist and shifted me into new artistic thematics. For me being in the studio is a combination of time spent viewing, inspecting and researching things that inspire me, time spent taking those components and studying how they interact together on my computer or within my sketchbook and then time spent creating fragments or a finished piece with them. The acts of free flow writing, listing words, making lines with tape and staring at the ceiling considering something are equally important to me as the physical act of pushing paint around on a panel. I often make small painting fragments on panels and then rearrange them with each other until a whole composition emerges. The separate components and surfaces I work with always feel as if they could move and be rearranged so it’s important for me to spend time in the studio doing this and making it an essential part of my process. I have found that I love bringing art into public spaces, whether through city commissioned public art work, murals or spontaneous site specific installations. Art outside of designated art spaces excites me in a very different way. Painting a mural and having UPS drivers and moms with strollers pull up and holler “awesome!” or give you thumbs up feels better than most museum pats on the back. Art is for everyone. After my kids are off to school in the morning and I’ve had a couple cups of strong coffee early is generally the best time to get to work. But sometimes inspiration and motivation hit in the evening on a Friday and you just roll with it and get going. Five years ago I was getting ready to finish my MA and I made my first text-based pieces and site-specific installation. That series was a collection of works examining White Noise, or cognitive dissonance in specific people who participated. Since then my work has become extremely colorful, more sculptural and has taken shape in text based paintings and site-specific installations. It was also over these years that my daughters learned how to read and learned how to construct phrases and decipher the meaning of words. This played a huge impact on the development of my work. My husband, Emmett Potter, is a huge influence and great source of inspiration. He is an artist, we share studio space and exhibit together frequently. His and support and understanding of the way I work has been invaluable and I am so tremendously lucky to be side by side with him in our journey as artists. My children also inspire me to enjoy the simple beauty in making art and never take for granted the tactile magic of pushing pure white gesso across a smooth sanded surface. As I draw from so many different genres of pop culture and literary and art history, I can’t list all of my influences but top of the list would be silent film actresses from the 1920’s, Lou Reed, James Gleick and his book “The Information,” Carl Jung and Patti Smith. I’m also grateful to every single second wave feminist artist who did the hard work they did so I can do what I do. I would either be a florist or a gardener in a coastal town because I could never be unhappy in the 24/7 company of flowers and growing things. 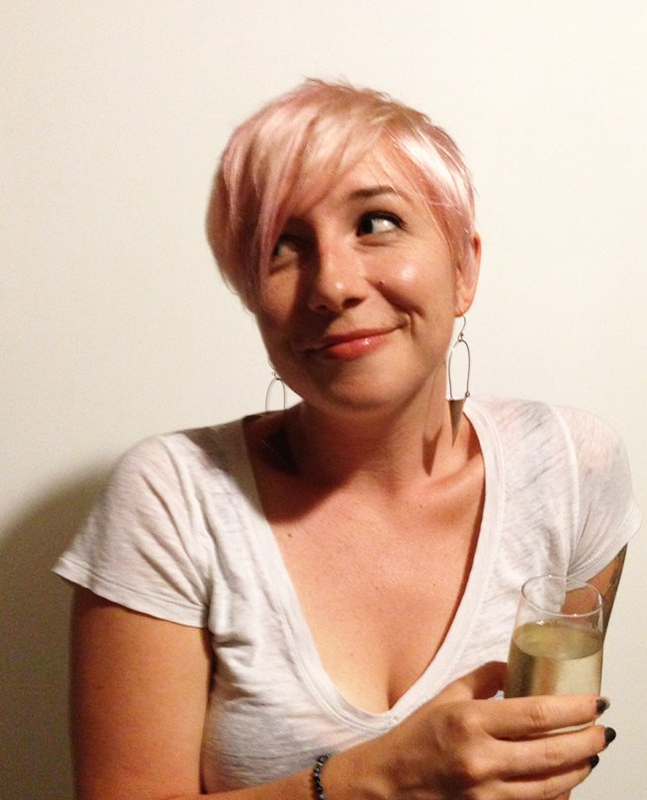 Kristin Bauer is a multimedia artist that lives and works in Tempe. Over the years she has exhibited extensively in galleries and museums in the region, including The Arizona Biennial at Tucson Museum of Art, Phoenix Art Museum and Mesa Arts Center, and has participated in group exhibitions in Los Angeles, Santa Fe and New York. 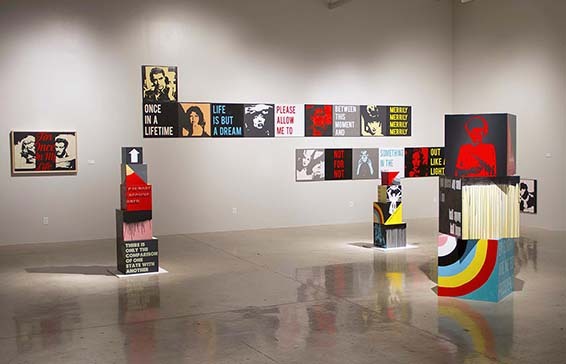 She has been a guest speaker at numerous college courses and in a panel at Phoenix Art Museum’s Contemporary Forum, where she also received an artist grant in 2012. She exhibits frequently with her husband, Emmett Potter, with whom she shares studio space. Bauer and Potter have collaborated on murals in Phoenix and for the Indy 500. Bauer’s background in the arts includes curating exhibitions, running a pop-up gallery with Potter, PR consulting for LA galleries, and arts writing for Beautiful/Decay, JAVA, FFDC and TONE. She obtained her BFA in Painting from ASU and an MA from Ottawa University and has two daughters who make life extra sparkly and interesting. 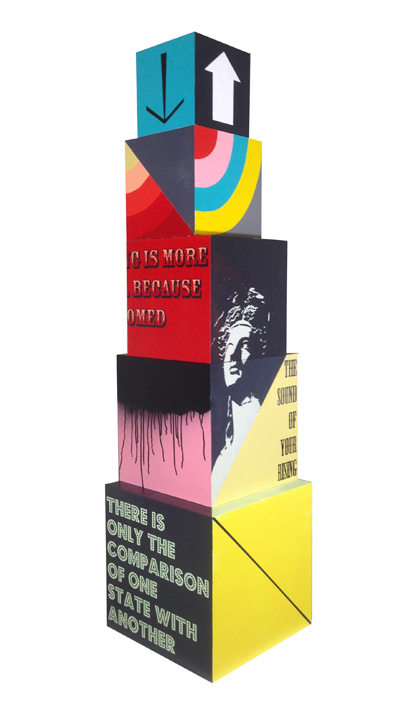 This entry was posted in Conceptual Art and tagged color, conceptual pop art, installation art, Kristin bauer art, text art. Bookmark the permalink.